This unique Vollrath 2200-13 Traex® clear Twin Tip™ standard bottle cap allows for two times the condiments compared to normal caps! Perfect for saving time in high-volume operations, this cap provides an efficient, mess-free alternative to standard one tip caps and allows you to quickly dispense condiments and dressing on sandwiches and salads with consistency. With this cap, one pass over the product will provide the same amount of coverage that is achieved with two passes of a standard cap. Saving time during the plating process allows you to get food out to your customers faster cutting down on wait time and customer complaints. Plus, you can improve the work flow in your kitchen in order for your staff to focus on additional food prep tasks. This cap's polyethylene design allows it be safely exposed to temperatures up to 170 degrees Fahrenheit, making it dishwasher safe. Its twin valves have a 1/10" opening and can be cut down, making it able to accommodate a wide range of toppings, from bacon bits, chutney, and seeds to ketchup and mayonnaise. The clear color of this cap is great for creating a color-coded system in your busy kitchen, and you can pair it with other colored caps in the line to easily identify which products are in your bottles at a glance. Perfect for sandwich shops, delis, and back of house food prep, this Twin Tip™ cap improves efficiency in your kitchen! We us this product on our sandwich line, it dispenses the correct amount of sauce in half the time allowing us to serve our guests fast! Product is easy to clean as well. This twin tip bottle cap is perfect for any instance in which you want to dispense a condiment at a higher rate than with a traditional single tip bottle cap. Be sure to also check out the tethered bottle cap lids to help keep your ingredients fresh. 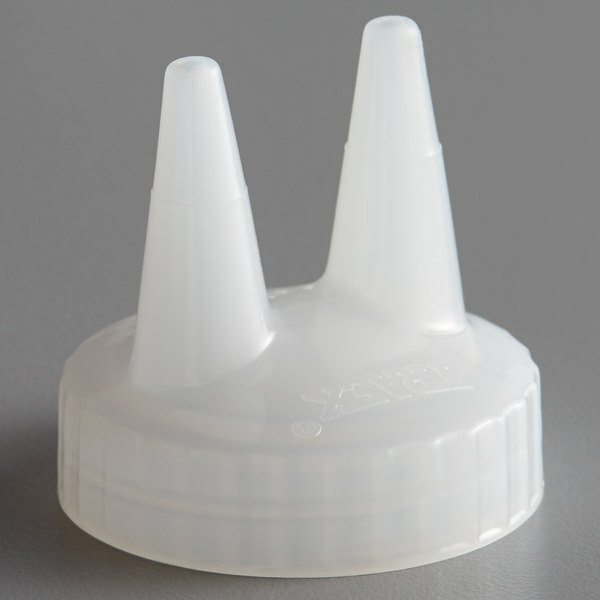 The Vollrath 2200-13 Standard Squeeze Bottle Cap with 2-Tips is a great product. 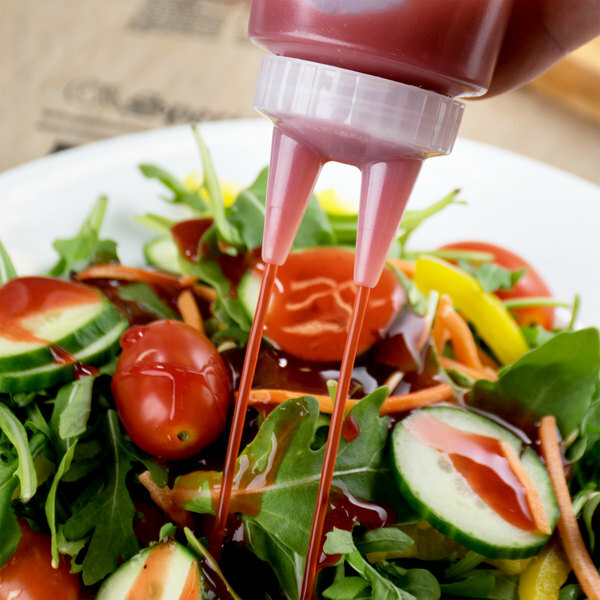 Perfect for salad dressing. The quality is great as well as the price. Highly recommend! Use this by replacing a basic squeeze bottle cap to dispense twice the amounts with one squeeze. For work that needs to get done quickly, or fillings that are doubled, this is great to have. Very good plastic for the make of the item. We will be using this for liquid seasoning around the grill. So t is hot all the time. These two tipped caps work great for all my condiments squeeze bottles very inexpensive and High quality I'll be buying more for my other squeeze bottles. WEBstaurantStore has so many wonderful products . We decided to use these at our wedding the squeeze bottle which contained bbq sauce..... Saved people time and kept the line moving which was great for everybody! This is a huge time saver when doing chocolate drizzles! A couple swipes over your product and you are done! I love it for Valentine's strawberries! I am in receipt of the Vollrath 2200-13 2-tips squeeze bottle caps which fit on standard sized squeeze dispenser bottles. Using this special cap makes every move more efficient as it dispenses and covers twice the amount in half the time. Working efficiently saves time and money, and everyone likes that. Webstaurant has so many different bottles that work with the Vollrath 2200-13 Standard Squeeze Bottle Cap with 2-Tips. For example, I know first hand it works great with the 12 oz squeeze bottle. Good for spreading condiments on sandwiches and other wider surfaces. Double the tips means half the time needed to spread the condiment. Prefer the wide one, but this works. Love these for designs for syrups and desserts. Very cheap and you can't go wrong with these. I would buy them again and again. Highly recommended. these lids are great for some dressings, do double duty and spread things out better with this 2-tipper. they will do the job well and holds up great. When you need to spread things in hurry as a caterer would need, or a Mom who makes lunch for two or more kids, when you are tired of wasting time using a knife for all the lunches you make.. Even using it for salad dressings will speed up the delivery time if your a caterer of throwing a party and need to season, garnish many food items! Its a time saver you never knew you needed until you own one!! I have been looking around for the 2-tip squeeze bottle caps and was really glad I finally found them. It works perfect decorating plates for my special desserts. I really, really like this 2-tip top! It makes topping my cheesecakes so much easier and of course faster!